The module outputs a score from -1000 to 1000 for each of: neutral, happiness, surprise, sadness, anger, disgust, fear, contempt. Note that this module does not include any face detection. Hence it always assumes that there is a face well centered in the image. 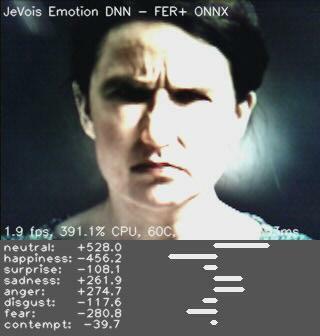 You should enhance this module with first applying a face detector (see, e.g., PyDetectionDNN) and to only run the emotion recognition network on the detected faces.